Self amalgamating tapes bond or fuses to itself when stretched. 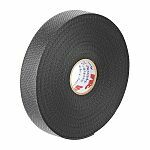 These tapes offer seamless bonding and can be waterproof and electrically insulating Self amalgamating tapes do not contain any glue or adhesive ingredients. The bonding occurs when the tape is wrapped around wires, devices or cables through a process called self-fusing. Due to the absence of gum, self amalgamating tapes are easy to clean or remove from product material. What are self amalgamating tapes used for? The tape has thermal conductivity features if made with iron oxide, which is used for wrapping and sealing wires and cables. The product is non-flammable and is often applied in the aviation and aerospace industries. Self amalgamating tape can also be used to repair holes and leaks in hoses and pipes. It is often applied to moisture sealing joints for insulation purposes, or used to seal splices and connections in electrical cables with high voltages. Various forms of self amalgamating tape exist. These can be made from ethylene propylene rubber (EPR), silicone or polyisobutylene (PIB).